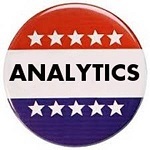 Carol Davidsen, former Director of Integration and Media Targeting for President Obama's 2012 re-election campaign, explains how big data is changing the political landscape. Description: Please join the MIT Sloan Boston Alumni Association on October 30th to hear from Carol Davidsen, former Director of Integration and Media Targeting for President Obama's 2012 re-election campaign, on the use of Big Data in Politics. Carol will talk about how big data is changing the political landscape by enabling politicians to advance causes, raise awareness, optimize the use of micro-targeting, and win elections. Carol has career experience tying together a variety of data sources to drive targeting for political and marketing campaigns. Carol Davidsen @cld276 is currently co-founder and CEO at cir.cl, INC　(a socially integrated marketplace for used goods) and partner at The Tusking Group (consultancy partnership specializing in big data, integration and media targeting projects). Carol was featured in the MIT Technology Review article, How President Obama's campaign used big data to rally individual voters and on the Fox News segment, "Campaigns using your data to capture your vote?" Carol's interview starts at 3 minutes into the video.